You work hard to make your lawn look its best. 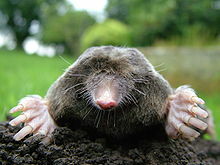 But pesky moles think it’s a 24-hour buffet, featuring all of their favorites: earthworms, grubs and other surface insects. Nothing can prevent moles from coming into your yard. Getting rid of them can become costly. Effective combination of baits and traps. Inclusive pricing – no charge per mole. Regular monitoring for new mole activity. Free follow-up visits for the first three weeks after treatment. This means we will return and retreat at no additional charge during that time. Take control of your lawn. Schedule a professional inspection and estimate today.